Discover Bang Krajao the Green Lung of Bangkok and get to experience a local community in a lovely green environment in the middle of Bangkok. This bike tour is ideal for those who want to see Bangkok in a whole new way. We bike though local backstreets to Queen Sirikit Park and Khlong Toei Market. This bustling local gem is Thailand’s biggest fresh food market, with hundreds of stalls selling everything from raw meat, vegetables, fruit and seafood, direct from the nearby fishing port. Prepare to be amazed by this busy market, where locals flock in search of the best bargain. Further on your bike tour you get the big Bangkok Chao Phraya River, where you board our long tail boats and make the river crossing to Bang Krajao Island. You will quickly feel this place is in many ways different to the Bangkok downtown, here everything is quiet, green and just very tranquil. We take our time to bike around and see the nature and local life in this wonderful place. There is many great trails and pathways to explore in this green maze. There will even be a nice thai lunch at local restaurant in Bangkok Krajao, where you will be served a delicious local dish (included). As well, there is water, fruit and local snacks provided along the whole bike tour. Value for money and satisfaction guarantee, this bike tour is not to be missed! 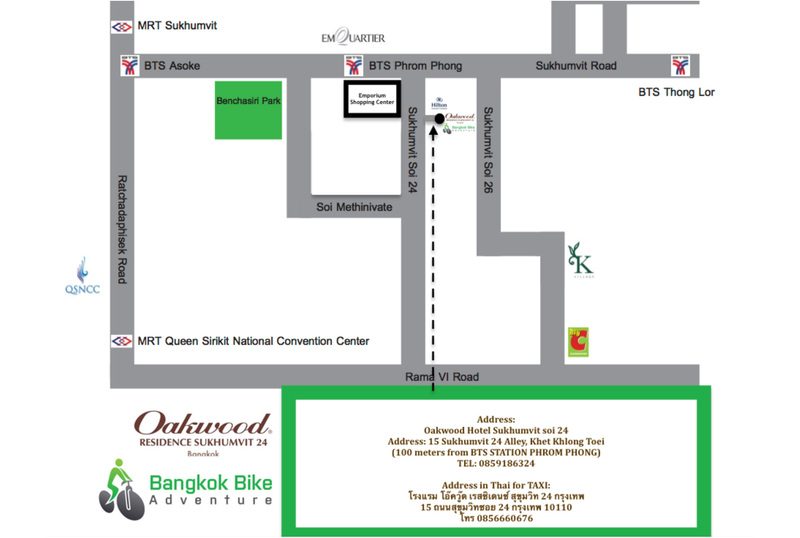 Our meeting point for the Bangkok Green Bike Tour is at Oakwood Hotel in Sukhumvit Road Soi 24. Its centrally located to majority of Bangkok hotels. Besides the BTS Skytrain, taxis are the most convenient way to get around Bangkok. Majority of Bangkok’s taxi drivers speak very little english. Please show your taxi driver our address in thai language. Beware to take taxi in good time during rush hours.